I always like to move stuff around in my room and I love moving my make up around. The only thing is for the first few weeks you always go in the wrong drawer when trying to find something. My make up collection has grown a little bit since I last did a make up storage post but it’s still quite small. I have all my face and eye make up stored in a tall chest of drawers and then my lips products on a small chest of drawers next to it. Prep My first drawer contains all my moisturisers and toners that I apply before I apply make up. I have a lot of products on the go but I am trying to use them up. At the back of the drawer I have a few sample sized products and random moisturisers. And I also have spare moisturisers which I buy when they are on offer. I really like using the Vitamin E toner water from Superdrug at the minute. Coverage The second drawer is primer, foundation, concelor and powder. There are also some false eyelashes and lip balms at the back as I ran out of room to put them anywhere else. Highlight, Bronze, Contour This drawer has all my powder blushes, bronzers and highlight in the left side. In the middle are my moe high end products and palettes. And the drawer on the right has all cream products and a sample size of Toof Face. Eyes This is drawer one of two for my eyes and contains mascaras in the left side and eye liners and eyelash curlers in the middle. 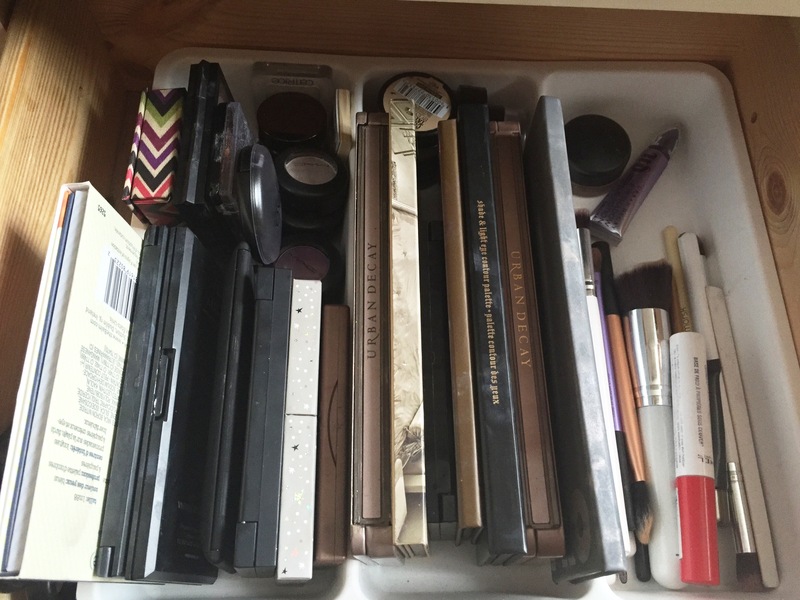 The left side contains all my eye brow products. Eyeshadow The final drawer contains my eye shadow palettes and individuals. I much prefer having a palettes rather than the individual eyeshadows so that’s why I have a few. The left side has all my eye shadow brushes and primers. Here is an over view of my lip products and the storage. In their own little section I have my Mac lipsticks which I love. I then have my face brushes behind them (which really need a clean). I need to buy a bigger brush container because not all of them fit in. I have a lipstick holder to hold my favourite and most used products so they are easy to find. My mum got me this little jar from Next for only a pound so I decided it would make a great home for my lip liners. The only problem now is that I want to fill it up! I then have two acrylic drawers from Amazon for about £11 each which I store the rest of my lipstick and lipgloss in. I love acrylic storage for makeup, it makes everything look so professional!